Kristonna Kramer, a Western Nebraska Community College student in Sidney, has been named the Nebraska New Century Workforce Pathway Scholar. The award highlights one student per state within Phi Theta Kappa (PTK) who will be entering the workforce after completing a certificate or earning an associate degree. The honor is presented to the student in each state who receives the highest PTK All-USA Academic Team application score, based on a judge's vote. 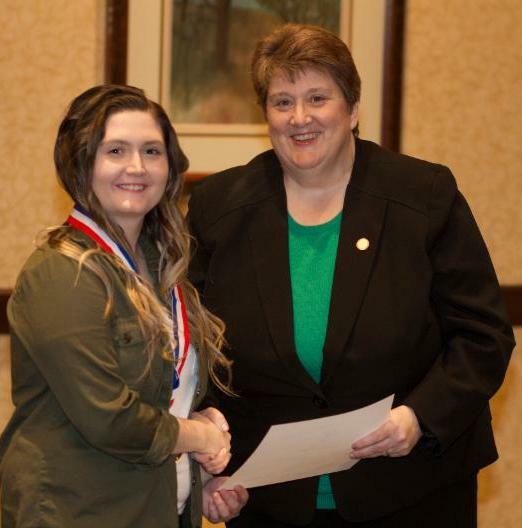 Kristonna Kramer, left, receives her PTK All-Nebraska Academic Team certificate. Kramer was also named the Nebraska New Century Workforce Pathway Scholar. "I was pretty surprised," Kramer said. "I wasn't expecting it, but it's really cool, and it's a pretty big honor to receive this." Considerations for the New Century Workforce Pathway Scholar award are based on the applicant's academic success and leadership qualities. Kramer has excelled in both categories as a Cougar. During her time at WNCC, Kramer served as secretary for the Student Senate in Sidney, worked as a resident assistant, was a student ambassador for the Aviation Maintenance program, and an active member of Phi Theta Kappa. Kramer is also consistently involved in campus activities, and takes part in a number of community events. At the Sidney Campus Student Awards Ceremony last month, Kramer received the presidential award, which is presented to a student who excels in academics, leadership, and service to the College and community. "Kristonna was a great asset to our campus but I also know that she will go on to do exceptional things and strive to be the absolute best that she can be," said Erin Huddleston, student services coordinator in Sidney. "She won't accept anything less for herself." After graduating Saturday with an associate of occupational studies in aviation maintenance, Kramer has accepted a job as an A&P mechanic for SkyWest Airlines out of South Bend, Indiana. "I like working with my hands a lot and I've always been interested in aviation, so I figured I could be in aviation and work on things," Kramer said. "Might as well put them together." In addition to being named the Nebraska New Century Workforce Pathway Scholar, Kramer was also selected to the PTK All-Nebraska Academic Team, along with fellow WNCC students Theresa Barnhart, Jerimiah Marchington, Andre Matzuda, and Natalie Saenz. To be considered, applicants must be a member of Phi Theta Kappa - which requires at least a 3.5 GPA - and submit a 500-word essay describing their most significant endeavor while attending the two-year school. Barnhart, a Lewellen native, is a middle level education major on the WNCC Sidney Campus. Barnhart, who recently earned the Board of Governors Award and Outstanding Mathematics Student at the Sidney Campus Student Awards Ceremony, is the Student Senate president in Sidney, is a student ambassador, member of the National Society of Leadership and Success, and math tutor. Marchington, of Sheridan, Wyo., studies business administration and accounting at WNCC in Scottsbluff. Marchington retired from the U.S. Army as a staff sergeant, and received the Bronze Star, Army Commendation Medal, Army Achievement Medal, and Iraq Campaign Medal. He's a member of Veterans Upward Bound at WNCC, TRiO, Cougar Leadership, and is the vice president of the Student Veteran's Organization. Matzuda, who studies sports administration at WNCC in Scottsbluff, will graduate with high honors (4.0 GPA). The Lima, Peru native is a member of the WNCC men's soccer team, and was named a National Junior College Athletic Association (NJCAA) First Team Academic All American. Matzuda is also a member of the National Society of Leadership and Success. Saenz, of Scottsbluff, is a journalism and broadcasting major and political science minor on the Scottsbluff Campus. On top of helping in the WNCC writing center and serving as a Spanish tutor on campus, Saenz is also a member of the National Society of Leadership and Success and Student Government. For more information on the PTK All-Nebraska Academic Team or the New Century Workforce Pathway Scholar recognition, contact Norman Coley at coleyn@wncc.edu. **Note: To request individual photos of award winners, please email Kyle Cummings at kyle.cummings@wncc.edu.